House Votes to Let Banks Take Deposits from Marijuana Businesses. In a historic vote this afternoon, the US House has approved an amendment to the Treasury Department appropriations bill barring the agency from spending any money to punish financial institutions that provide services to marijuana businesses where it is legal. The amendment was sponsored by Reps. Heck (D-WA), Perlmutter (D-CO), Lee (D-CA) and Rohrabacher (R-CA). It passed with bipartisan support. DC Decriminalization Law Goes Into Effect Tomorrow. As of one minute after midnight, the possession of an ounce or less of marijuana will be decriminalized in the nation's capital. Jail time for pot possession will be replaced with a $25 fine. A Republican-led effort in the House to block it remains alive, but will not stop the law from taking effect -- at least for now. That effort still has to get through the Congress and overcome White House opposition, and that looks like a long-shot at this point. Grosse Point, Michigan, Initiative to Legalize Up to an Ounce Turns in Signatures. A municipal initiative campaign to legalize the possession of up to an ounce of pot in the Detroit suburb of Grosse Point turned in more than 600 signatures today. The group needs 493 valid voter signatures to qualify for the November ballot. Grosse Point is one of a handful of Michigan towns with similar campaigns this year, including Berkley, Hazel Park, Huntington Woods, Oak Park, and Pleasant Ridge. Santa Fe, New Mexico, Initiative to Decriminalize Marijuana Possession Turns in Signatures. Progress Now New Mexico and Drug Policy Action (the campaign arm of the Drug Policy Alliance) have submitted more than 7,000 signatures for an initiative that would decriminalize the possession of up to an once of marijuana. They need 5,763 to qualify for the ballot. DC City Council Approves Medical Marijuana Expansion. The city council Tuesday approved legislation to loosen restrictions on the District's medical marijuana program. The measure replaces a restrictive list of defined illnesses and conditions with a blanket authority for doctors to recommend medical marijuana for "any condition for which treatment with medical marijuana would be beneficial, as determined by the patient's physician." Michigan Legislature Set to Vote on Medical Marijuana Improvement Measures This Week. Senate Majority Leader Randy Richardville (R) said he expects the Senate to vote this week on a pair of measures to improve the state's medical marijuana program. One would allow localities to govern their own dispensaries; the other would allow the sale of edibles and concentrates. LA Medical Marijuana Farmers' Market Hit With Temporary Injunction. A Los Angeles Superior Court judge Tuesday issued a temporary restraining order shutting down a medical marijuana farmers' market that drew thousands when it opened a couple of weeks ago. A hearing on a permanent injunction is set for August 6. 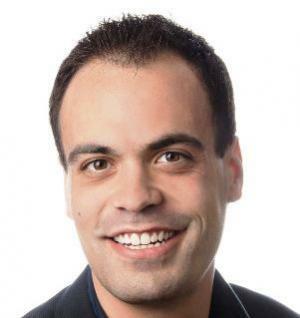 Thousands Sign Petition Supporting Fired University of Arizona Researcher. A petition demanding that the University of Arizona research scientist Dr. Suzanne Sisley be rehired after being fired after she won federal approval to study marijuana for military veterans with post-traumatic stress disorder has received more than 27,000 signatures. Sisley made no bones about blaming conservative Arizona political figures for her firing. Click on the link to read her comments. Ohio Cops Slow to Carry Overdose Reversal Drug. Gov. John Kasich (R) signed a law allowing law enforcement officers to carry and administer the opiate overdose reversal drug naloxone in March, but Ohio police are slow to get with the program. Police in Columbus said they have no plans to carry it "anytime soon," and many rural agencies are also unwilling to do it. About 17 people a week are dying from opiate overdoses in Ohio. Under the new law, the drug is also available to friends, family members, and "others who may be in a position" to assist with reversing overdoses. Miami Agrees to Pay in Death Squad-Style Police Drug Robbery Sting Killings. Miami-Dade taxpayers will shell out $600,000 to the families of three men killed by a Miami-Dade SWAT team during a drug house robbery sting. Four men, including an informant for the police, were gunned down when they appeared on the scene of a home they had been told was stuffed with drugs for them to rob. The informant's family didn't join the settlement; it is pursuing a wrongful death lawsuit in federal court. Police video of the raid shows officers firing dozens of shots into the body of a man already on the ground. 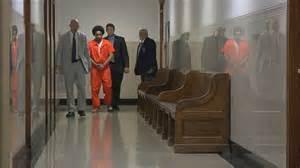 It also shows the informant surrendering to police moments before they shot and killed him, too. Prosecutors suspect police officers of misconduct but were unable to develop enough evidence to charge any of them. Almost All US Wiretaps Are for Suspected Drug Deals. A new Administrative Office of US Courts report reveals that not only did wiretaps hit an all time high last year, but that nearly 90% of them were for drug investigations. Of the 3,576 wiretaps sought by federal law enforcement agencies, 3,115 were for drug investigations. Vera Institute of Justice Releases Report on 2013 State Sentencing Reforms. The report, Recalibrating Justice: A Review of 2013 State Sentencing and Corrections Trends, finds that 35 states passed at least 85 bills to reform sentencing and corrections last year. The legislation generally focused on reducing prison populations, strengthening community-based corrections, supporting reentry, and creating better research and analysis to drive policy decision-making. Dutch Border Town Cannabis Café Owner Cleared of Most Charges. The owner of the Checkpoint Café in the in the town of Ternuezen near the Belgian border has been cleared of most charges against him by an Amsterdam appeals court. The café was closed in 2007 for violating government rules on soft drug sales, and the owner was found guilty of membership in a criminal organization. But the appeals court ruled that the state had not proven Checkpoint knowingly broke the rules. It was the second such decision in the past month. In a historic vote this afternoon, the US House has approved an amendment to the Treasury Department appropriations bill barring the agency from spending any money to punish financial institutions that provide services to marijuana businesses where it is legal. The amendment was sponsored by Reps. Heck (D-WA), Perlmutter (D-CO), Lee (D-CA) and Rohrabacher (R-CA). It passed with bipartisan support. This is the second time in less than two months that the House has voted to roll back marijuana law enforcement. In May, the House passed an amendment prohibiting the Drug Enforcement Administration (DEA) from undermining state medical marijuana laws and passed two amendments prohibiting the DEA from interfering with state hemp laws. The exhibition hall in the Denver Convention Center last week was a wonder to behold. Automated, high-capacity marijuana trimming machines. Industrial strength cannabis oil extraction devices. Marijuana real estate specialists. Marijuana accountants. Marijuana attorneys -- real estate, intellectual property, contracts. Marijuana consultants. Marijuana investment advisers. Point-of-sale marijuana sales tracking systems. Chemical testing companies. Vaporizer sellers. Odor-proof bag producers. Automated rolling machine makers. Anything and everything to do with the business of legal marijuana. All in a high-gloss trade show environment. It was the National Cannabis Industry Association's (NCIA) Cannabis Business Summit, which brought more than 1,200 registrants to the state capital that for now at least is also the capital of legal marijuana. And it represents a new phase in the evolution of marijuana policy. This is not your father's marijuana movement. There were lots of men in dark suits and ties, lots of women in snappy professional attire. A few dreadlocks here and there, but only a few. And nary a tie-dye to be found. There wasn't a whole lot of talk about how "We have to free the weed, man;" although social justice including ending prohibition came. up. There was a whole lot of talk about business opportunities, investment strategies, and how to profit from crumbling pot prohibition, as well as the dangers and pitfalls facing would-be entrepreneurs in an industry still illegal under federal law. The legal marijuana industry has been bubbling up for awhile now, building from the quasi-legalization that is medical marijuana in Wild West California and the more regulated, but still thriving medical marijuana industry in states like Colorado, Oregon, and Washington. In the past decade or so, the High Times Cannabis Cup has evolved from a November trip to Amsterdam to a virtual traveling circus of all things pot-related. And marijuana trade expos have drawn crowds in the tens of thousands. But one can reasonably argue that last week's Cannabusiness Summit represents the maturation of marijuana as an All-American business opportunity. With Colorado this week beginning to accept applications from people who don't represent medical marijuana dispensaries (for the first six months of commercial legalization, only operating dispensaries could apply) and Washington state set to see its first retail marijuana operations next week, the era of legal marijuana is truly upon us. And it's likely to continue to expand, with Alaska, Oregon, and Washington, DC, poised to join the ranks of the legalizers after elections later this year. Talking up the product in the exhibition hall. The Cannabis Business Summit was, unsurprisingly, mainly about the nuts and bolts of operating a legal marijuana business. 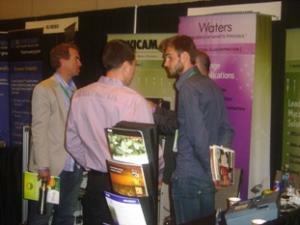 It could have been any industrial trade show and conference, except this was about weed. Panels covered topics such as "Grow 101: Cultivation Facility Build-Out and Management Best Practices," "Advanced Cultivation: Scalability, Sustainability, and Growth Management," "Protecting Your Investment: Risk Management and Insurance for the Cannabis Industry," and "International CannaBusiness Opportunities." And that was just session one of day one. Marijuana is an industry on a roll, and the NCIA can point to its own success as exhibit one. 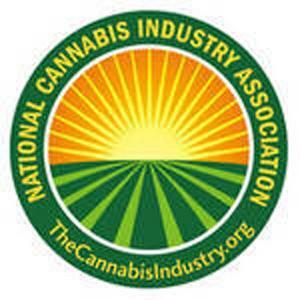 "We now have over 600 marijuana business members, and that has doubled since January," said NCIA founder and executive director Aaron Smith in a keynote speech. "When Steve Fox and I started the NCIA in 2010, we had 20 members. 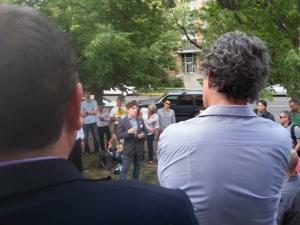 Investors and entrepreneurs are rushing into this new space." That, in turn, is allowing NCIA to expand its operations, Smith said. "We're seeing more experienced business people because they understand what a trade association is," Smith explained. "So we've been able to staff up, we have a full-time DC lobbyist, which is a first for the industry, and we've already contacted every congressional office on the Hill and had sit-down meetings with half the House offices and 30 Senate offices. We're also attending campaign fundraisers on behalf of the NCIA." 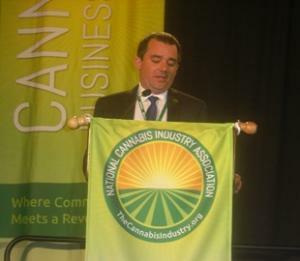 Although the conference was all about business, Smith made clear that the NCIA had not forgotten that these business opportunities have come about because of a decades-long movement for social justice and human liberation around marijuana policy. "We have to acknowledge those who came before us," he told his audience of businesspeople. "Before we were an industry, we were a movement, and we are still a social movement. The growth of this new industry will drive the final nail in the coffin of marijuana prohibition, so that no one is put in a cage for using a beneficial, extremely therapeutic herbal product ever again." NCIA executive director Aaron Smith gives a keynote address. The industry has to put its best face forward, Smith said. "We are still under scrutiny, the world is watching Colorado and Washington, as well as the medical marijuana states, and we have to lead by example," he said. "Be a good neighbor and corporate citizen. Reach out to neighborhood associations and work with them. Contribute to the community. Be a model citizen. Be professional. Don't use marketing you wouldn't want your mother to see." Smith wasn't the only NCIA officer to warn the industry it needed to watch its step. NCIA deputy director Taylor West had more words of wisdom in a session on marketing and communications. "This is a cultural movement in the midst of an enormous wave, and we have the opportunity to define an idea on the rise, to be responsible, and to do the education around that," she said. "We are building an industry from scratch, and we have to take this opportunity to make this an industry that's not like every other industry." That requires some maturity within the industry, the communications specialist said as she displayed tacky advertising images of scantily clad women covered in marijuana buds. "Responsible branding is important," West noted. "Don't screw it up for everybody. We don't have a rock-solid foundation, and we're still very vulnerable from a public opinion and policy standpoint. Don't market to children and don't market like children," she said. "We're like the wine industry or craft beers or wellness. No one is ever drunk in a wine commercial. And," she said, pointing to the tacky ads, "don't alienate half the population." There are many issues facing the nascent marijuana industry, but both the conference agenda and the talk in the corridors made it clear that the federal tax issue takes center stage. Under current federal law, marijuana remains illegal, and that means marijuana businesses cannot take standard business tax deductions under an Internal Revenue Service (IRS) provision known as 280E. "This law must be changed, and this law can be changed. If Obama won't do it, we will do it for them," said marijuana tax attorney Henry Wykowski before heading deep into the weeds in a discussion of the intricacies of dealing with 280E. "There is legislation to address this," said NCIA Capitol Hill lobbyist Mike Correia, pointing to Rep. Earl Blumenauer's (D-OR) House Resolution 2240, the Small Business Tax Equity Act of 2013. But it's unlikely to go anywhere anytime time soon, Correia said. The congressional bill tracking service GovTrack.us agrees, giving the bill zero percent chance of passage this session. "This is sitting in Ways and Means," Correia explained. "It's a Democratic bill in a Republican-controlled House, and the committee chairman is not a fan." There is one back-door possibility for moving the bill, though, the lobbyist said. 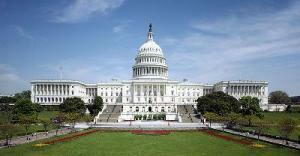 "Every few years, the Congress addresses aspiring tax breaks," he noted. "They usually pass it in the middle of the night when no one is watching. I hope to have 280E provisions inserted into a bigger tax bill, but we need to get Republicans to support it. The Ways and Means members are not from marijuana-friendly states, so it's hard to get traction, but next year, Paul Ryan (R-WI) will be chair, and he could be more responsive." The nascent marijuana industry has other issues, of course, but the Denver conference was a strong signal that the marijuana movement is indeed mutating into a marijuana industry. The power of American entrepreneurialism is very strong, and it looks like it's about to run right over the remnants of marijuana prohibition. But the industry needs to remember that while we now have legal marijuana in two states, there are still 48 states to go. For people in Alabama or South Dakota or Utah, for example, the issue is not how much money you can make selling marijuana (or marijuana-related products or services), but the criminal -- and other -- consequences of getting caught with even small amounts. If the industry is indeed the movement, it needs to be putting its money where its mouth is to finish the work that remains to be done. 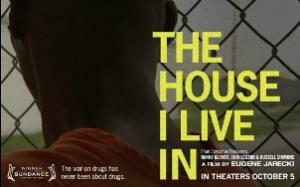 In a conference call Monday morning, filmmaker Eugene Jarecki discussed the impact of his award-winning drug war documentary The House I Live In and where we go from here in the fight to end the drug war and mass incarceration. The call was the second in a series of discussions planned and organized by the Drug Policy Alliance as part of its campaign to deepen and broaden the drug reform movement. The first discussion featured Michelle Alexander, author of The New Jim Crow. Hear that conversation here. Jarecki won the Sundance Film Festival grand jury prize for The House I Live In in 2012. The film made a shattering case against the drug war. Since its release, it has been used as a primer in faith institutions, schools and community-based organizations across the nation. The drug reform landscape has been undergoing tectonic shifts in the two years since The House I Live In was released. It is possible, Jarecki said, that his film has played a role in shifting public opinion. "One of the great lies that pervades the public imagination is the Hollywood lie that its movies don't shape the violence in this country," he said. "For Hollywood to pretend that movies have no role in shaping behavior is laughable. There are books that start revolutions. While Hollywood should bristle at the notion that movies create violence -- the violence comes in a society where we don't have health service and the roots of unwantedness can lead to violent behavior -- movies do shape public activity," he said. "My movie is shaping public activity, and I am reminded by friends that this matters," the filmmaker continued. "A lot of young people will look at Michelle Alexander and say 'I want to be like that,' and that kind of example is extremely precious." The recognition that the film would be an instrument of social change even influenced the title, Jarecki said. "The making and handling of the film as a tool for public change and discussion" was important, he said. "We called it House over sexier titles, such as Kill the Poor or just Ghetto. I couldn't get it in a church or prison with a title like Kill the Poor. We had to choose a softer title; we weren't just thinking about the most poetic title, but really, how do we make sure this thing has legs where people all across the country can use it? We didn't want to alienate groups on the ground, and I wanted to make sure there were many groups on the ground doing this important work." It worked. The film is now standard viewing in all the prisons in at least 11 states, and in New York, a viewing serves as an alternate punishment for juvenile offenders. And, Jarecki said, churches have been a key partner in getting the message out. "We've found churches very welcoming, in large part because of our partnership with the Samuel Dewitt Proctor Conference," he said. "They've helped get churches across the country seeing the film, and it stretches far beyond the black church community. It's been very useful and robust. We also live stream the showings themselves to other churches. When we broadcast out of Shiloh Baptist Church, 180 other congregations also watched it." But while Jarecki intended the film to serve polemic purposes, even he was surprised at the rapidity of the changes coming in the drug policy realm. "The most significant surprise has been seeing the entire climate of the war on drugs change in the public imagination," he said. "When we started out, it was impossible to imagine any systemic shifts from the top. We see that the entrenched bureaucracies and corrupt interests are never open to negotiation, but the combination of the moral bankruptcy of the war on drugs and its economic bankruptcy -- 45 million drug arrests over 40 years, and what do we have to show for it? -- the catastrophic cycle of waste without achieving goals, unifies the left and the right like no other issue. The left sees a monster that preys on human rights for profit, and the right sees a bloated government program." The policies of the war on drugs are now vulnerable, Jarecki said. "Community groups see how it brings unfairness to communities and ravages society, so now, Washington is trying to appeal to the public by being more sensible," he argued. "This policy is vulnerable. While we've joined forces with the Drug Policy Alliance and other organizations to fight at the ground level, we're also seeing shreds of leadership from Obama, Holder, and Rand Paul. This is a moment of enormous vitality for us." With a few exceptions, as mentioned just above, "the political class is isolated and orphaned as supporting something that doesn't make any sense," Jarecki said. "I thought I was choosing a very tough enemy, but it doesn't seem like much of a worthy adversary. The gross expenditures are hard to defend, they don't have the national security card to play anymore, the drug war has worn itself thin. 'Just Say No' and 'This is Your Brain on Drugs' hasn't worked. Instead, people just see family members with damaged lives." It's not just in the realm of marijuana policy that the landscape is shifting in a favorable direction. The issue of the racial disparity in the drug war is also gaining traction. "The condition of understanding the black American crisis of the drug war has moved light years in the last two years," Jarecki said. "Black folks are bizarrely and disproportionately targeted by the drug war, and that's become a common discussion. It's not a rare thing." That understanding is extending to an acknowledgement that the war on drugs has been a brutal attack on the gains of the civil rights era, Jarecki argued. "In the black American story, there is an argument to be made that the new Jim Crow established with the war on drugs was the final nail in the coffin of the civil rights movement," he said. "Black people are worse off economically than before the civil rights movement, and this critical viewpoint has become more widely understood." But it's not just race. The unspeakable word in American political discourse -- class -- plays a role as well, Jarecki suggested. "We've seen a shift from a drug war that could be described as predominantly racist to one that also has elements of class in it," he argued. "Poor whites, Latinos, women -- those are the growth areas for the war on drugs now. But let's not forget that black America is still essentially the leading link. We haven't shifted the drug war from race to class; it has diversified, it preserves its racism, but has seized market share by broadening into other class populations." Racism and the war on drugs are only a part of a much larger problem, the filmmaker argued. "We have to invite the country to begin seriously asking itself what kind of country it wants to be," he said. "What we are really looking at is a society that has bought into the notion that we can entrust the public good to private gain. We have industrial complexes that grip American policymaking in almost every sphere of public life, and the prison industrial complex is one of them. It is simply a crass illustration that you can feed a human being into the machine, and out comes dollar signs. This is a country without compassion, a town without pity." And while change will come from the top, it will be impelled only by pressure from the bottom up, he said. "Change comes from groups working together, and you start going down that road by getting out and starting walking," Jarecki advised. "It's an illusion to think we're supposed to be rescued by the government." We have to do it ourselves. MPP Gives Alaska Initiative Campaign Big Cash Contribution. 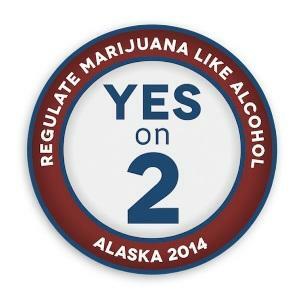 The Marijuana Policy Project, which is backing the Alaska legalization initiative, has just kicked in another $140,000. That's the second largest contribution to the campaign yet (the biggest, also from MPP, was $210,000), and pushes its total contributions to over half a million dollars. The organized opposition -- Big Marijuana, Big Mistake, Vote No on 2 -- has, on the other hand, raised only $31,000, most of it in a single donation by an Alaska Native village corporation. Peter Lewis Family Gives Oregon Initiative Campaign Big Cash Contribution. A PAC controlled by heirs of Progressive Insurance founder and drug reform funder Peter Lewis has donated $250,000 to the New Approach Oregon legalization initiative. Lewis had donated $96,000 before his death last fall, and there were fears his death could end his reform largesse, but his family is carrying on. The group has raised more than $900,000 overall. SurveyUSA Oregon Poll Has 51% for Legalization. A new SurveyUSA poll in Oregon has 51% supporting marijuana legalization, with 41% opposed, and 8% undecided. The poll comes as three legalization initiatives are in the final weeks of signature-gathering to put the issue on the November ballot. Initiative organizers are not going to breathe easy with numbers like these, though; the conventional wisdom is that initiatives want to be polling at 60% or above before the campaign begins in earnest. Click on the link for demographic and methodological details. DC Council Moves Toward Approving Expanded Medical Marijuana Access. The District of Columbia city council moved ahead yesterday with plans to expand access to medical marijuana. In a joint session of the Health and Judiciary and Public Safety committees, the council gave preliminary approval to two bills. Bill 20-766, cosponsored by every member of the council, would repeal the qualifying conditions list and allow physicians to recommend marijuana to any patient they think marijuana would benefit. Bill 20-678, will increase the number of plants a cultivation center could possess from 95 to 500, better ensuring that patient need is met. Feds Warn Casinos to Not Take Bets Made With Marijuana Money. Federal regulators addressing a banking secrecy conference in Las Vegas yesterday warned casinos they can't accept bets from people working in the marijuana industry unless the casinos undertake rigorous background checks and allow the federal government to monitor the bets. That's because casinos are subject to the same financial reporting requirements as financial institutions. It's a lengthy report; click on the link to read it all. Fair Sentencing Act Gets Another Cosponsor. Add Rep. David Joyce (R-OH) to the list of cosponsors of the federal Fair Sentencing Act of 2013. He signed on yesterday. That makes 24 Democrats and 14 Republicans. The bill is before the House Judiciary Committee. Clicking on the link will take you to the bill. Virginia Sheriff's Office Makes Mass Drug Bust… Again… and Again. The Amherst County Sheriff's Office announced yesterday that a county grand jury had indicted 68 people on drug charges after a months-long investigation by the department. It's the third mass bust since 2010's Operation Silent Night and 2012's Operation Avalanche. The sheriff's office seems to understand--at least on some level--the futility of such operations: "It stops these folks from selling drugs [but] as soon as you remove these folks, someone else takes their place. It's a never-ending cycle we're working on," a spokesman said. Jamaica Will Decriminalize Marijuana Possession. Jamaica will decriminalize the possession of small amounts of marijuana, the government announced yesterday. It will also allow possession for some medical and scientific purposes. And it will allow possession for religious purposes. Justice Minister Mark Golding said that the cabinet is supporting a proposal to decriminalize the possession of to two ounces of the ganja. Under the proposal, those caught with marijuana could be subjected to fines, but not criminal charges. Bermuda's Attorney General Says Government Should Consider Marijuana Decriminalization. As the Bermudan government mulls marijuana reform, new Attorney General Trevor Moniz has come out for decriminalization. Moniz would prefer "a system where if you get caught with a small amount of marijuana, you don't go to court and you wouldn't have any criminal record," he said. "In New York and the UK., they have a caution only for a first offence, which may need to be broadened. I'm in favor of small steps, incremental steps, rather than a big leap," he added. Barcelona Bans New Cannabis Clubs for a Year. Citing a proliferation of private cannabis clubs and a lack of regulation, the Barcelona city council announced today it was instituting a moratorium on new clubs for one year. The crackdown comes just days after a club was closed for illegal sales. The clubs allow members to grow and consume their own cannabis, but they aren't supposed to sell the stuff to outsiders. The clubs have been attracting cannabis tourists from around the world. Conflict in Turkish Municipality Tied to Marijuana Crop. Three weeks of violent protests in the municipality of Lice in Diyarbakir Province, where Kurds predominate, are linked to the looming marijuana harvest, some of the profits from which are destined for the Kurdistan Workers Party (PKK), according to this report. Violent incidents have been ongoing since demonstrators attacked a security forces outpost with homemade bombs and Molotov cocktails, and soldiers opened fire, killing the nephew of a "notorious trafficker." The Obama administration Thursday afternoon announced new guidelines that will allow financial institutions to provide services to marijuana businesses in states where it is legal. The guidelines will apply to both medical marijuana and legal marijuana states. Some 20 states and the District of Columbia allow for medical marijuana, while two states, Colorado and Washington, have legalized marijuana commerce for adults. Banks and other financial institutions have been increasingly unwilling to deal with marijuana-related businesses for fear of breaking federal laws. That has led to an untenable situation where marijuana businesses are forced to deal in large amounts of cash. The guidelines were issued by the Department of the Treasury's Financial Crimes Enforcement Network (FinCEN) in concert with the Department of Justice. Deputy Attorney General James Cole is also issuing supplemental guidance to prosecutors on how to decide whether to prosecute federal money laundering and Banking Secrecy Act violations related to legal marijuana commerce. In a joint statement, the two departments said the guidelines will provide "greater financial transparency" in an industry where the federal government is concerned about diversion and the encroachment of organized crime. The guidelines envision financial institutions helping law enforcement with "information that is particularly valuable" by filing regular reports that can provide insight into the industry's contours. The issuance of the guidelines is the next step in the administration's de facto acceptance of legal marijuana and medical marijuana. Last August, the Justice Department announced it would not seek to undermine state marijuana laws and issued guidance to prosecutors (the "Cole memo") telling them to lay off unless businesses or individuals were violating a set of enforcement priorities, such as diverting marijuana outside the state or making money for organized crime. 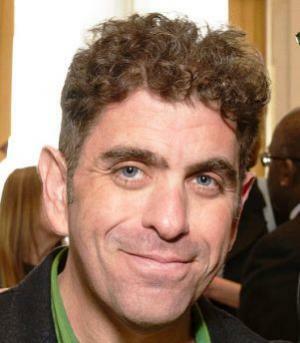 Ethan Nadelmann, head of the Drug Policy Alliance, pronounced it a good thing. "It appears that the Obama administration is trying to provide as much protection as possible for the marijuana industry, given the constraints of federal law," he said. "The assurances the administration have provided appear fairly substantial and will hopefully prove sufficient so that banks will feel safe doing business with the marijuana industry. I have to say I'm impressed by how the White House is trying to make this work, especially given the inability of Congress to do anything constructive in this area." So did Steph Sherer, head of the medical marijuana advocacy group Americans for Safe Access, although she called for a more comprehensive federal response. "We have been pushing the federal government for years to make these commonsense concessions and we're pleased that the Obama Administration is finally doing so. At the same time, a piecemeal approach to medical marijuana policy is shortsighted and is an issue that deserves a comprehensive public health solution," she said. "We will certainly be working with banks, credit unions, and credit card companies to ensure proper implementation of this federal guidance," continued Sherer. "Removing the risks of operating as an 'all-cash' business cannot be overstated, but we will also continue to put pressure on the Obama Administration to wrap these types of discrete practices into a more comprehensive medical marijuana policy." Attorney General Eric Holder said Thursday that the Obama administration would soon announce regulations that would allow banks to business with legal marijuana businesses. Financial institutions have been scared away from such businesses by the threat of legal action for dealing in the profits of a commodity still illegal under federal law. The Obama administration had previously signaled it was working to address the issue, but it now appears action is imminent. "You don't want just huge amounts of cash in these places. 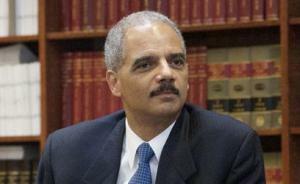 They want to be able to use the banking system," Holder said during an appearance at the University of Virginia's Miller Center. "There's a public safety component to this. Huge amounts of cash -- substantial amounts of cash just kind of lying around with no place for it to be appropriately deposited is something that would worry me, just from a law enforcement perspective," he explained. "We're in the process now of working with our colleagues at the Treasury Department to come up with regulations that will deal with this issue," and the new rules are coming "very soon," Holder said. "It is an attempt to deal with a reality that exists in these states." Holder did not specify whether his remarks were aimed solely at Colorado and Washington, which have legalized marijuana commerce, or were directed more generally at states that allow for legal medical marijuana. A Justice Department spokesman later "clarified" Holder's remarks to say that instead of new regulations, Holder was speaking of issuing a "guidance" to prosecutors and federal law enforcement. Whether such a "guidance" without further guarantees from the federal government will be enough to assuage bankers' fears remains to be seen. 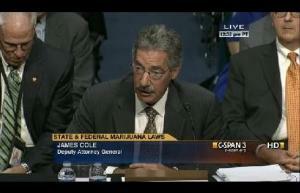 But marijuana industry advocates applauded the attorney general's remarks. For the legal, regulated cannabis industry, this is very welcome news," said National Cannabis Industry Association executive director Aaron Smith. "We have been anxiously awaiting clarity on the banking issue from the Justice and Treasury Departments for many months. To hear that guidance will be issued 'very soon' is encouraging. It's critical that we fix this issue before February 20, when our Colorado members must pay their first round of state taxes, or the Colorado Department of Revenue may be forced to accept more than $1 million in cash payments." Smith added that the NCIA was "grateful" to Holder and other federal officials who have been working on the issue, and that getting it resolved "cannot come soon enough." Starting January 1, any person in Colorado over the age of 21 can walk into a retail marijuana facility and purchase marijuana with just a show of ID. While the process should be simple for those who choose to imbibe legally, things have not been so simple for the dispensary owners who have made the choice to sell retail marijuana. Luke Ramirez is one of these owners. His store, Walking Raven, sits on one of Denver's busiest streets. For Ramirez, planning for retail marijuana sales began in February of 2012, when Walking Raven officially endorsed Amendment 64, the legalization initiative that won at the ballot that November. Even with almost two years of planning behind him, he finds that there are still a lot of hurdles to overcome. It wasn't until May of 2013 that Ramirez and other dispensary owners knew what would be expected of them by the state. Even with state legislation settled, Amendment 64 allows for municipalities to come up with even stricter rules for retail marijuana stores. Denver started working on its own regulations in September, and wasn't done when the Chronicle spoke with Ramirez in late December. Though he was only the seventh person in the city of Denver to apply for a license, the constant changes mean that he won't be able to open until about January 10, over a week beyond the official start of recreational marijuana sales. In late December Ramirez was still getting calls about changes to marijuana laws at the city level. The process has been similar for dispensary owners all over Denver, which means it might be one of the few places where a legal retail marijuana shortage will happen right away. The licensing for retail locations and retail grows is happening at the same time. This would be a problem for those trying to open on January 1, except that the state has allowed a one-time transfer of medical marijuana to retail. This transfer is how all stores will start, and it gives a little something extra to the consumer as well. The edible companies have to go through the same process as other marijuana facilities, but some are opting out in the early stages. During the one time transfer, marijuana stores can make some edibles retail that otherwise wouldn't be available. This means some store owners are stockpiling certain items that they feel will be popular with retail consumers. Ramirez has opted out of stockpiling because he simply can't afford it. The cost of selling retail marijuana is incredibly high, which prices smaller dispensaries out of an immediate switch. All told, Ramirez has spent $60,000 dollars going through the process of getting licensed and prepared to make the switch. Before he actually gets his license he expects to spend about $10,000 more. Money is a huge concern for retail marijuana dispensaries, and Ramirez is unsure of whether they will be able to make it all back during the first few months of retail sales. He acknowledges that the supply for retail just won't meet the demand, and worries that owners will see the same marijuana shortage that caused some of them to temporarily close their doors in 2012. This, of course, affects the people who work behind the counter. Ramirez wants to make sure that all of his employees are well-taken care of, but he acknowledges that he may have to cut back on hours at some point. The marijuana shortage has another effect on the market. With marijuana prices possibly going as high as $70 for an eighth, Ramirez says that retail marijuana "won't get rid of the black market until supply meets demand." In the meantime, his store and many others will have to compete with the grey market that has sprung up on Craigslist since the passage of Amendment 64. Despite the many difficulties in his way, and the five inspections that he has to go through, Ramirez is confident that he is making the right choice. While he cannot sell retail marijuana at present, he is concerned to ensure that marijuana is still available for his current customers: medical marijuana patients. "Patients definitely still need medicine," he says, and that's why he's sure to always have some on hand, segregated from retail marijuana for non-patients. Retail and medical marijuana are sold in the same store, but they have to be kept in separate containers. Medicinal users can purchase retail, but retail consumers cannot get any of the medical marijuana regardless of a possible shortage. Despite eventual plans to sell only 10% of his product as medicinal, Ramirez is determined to always be able to take care of the patients. They are, after all, the ones that supported him before the end of prohibition in Colorado. It's not just medical and legal marijuana states that watched the Justice Department's announcement of its response to marijuana law reforms in the states with interest. Nine states have laws regulating the production of industrial hemp, and ten more have asked Congress to remove barriers to industrial hemp production. 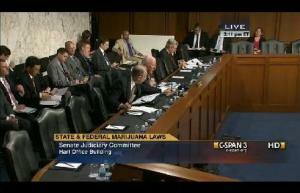 Hemp is also moving in the Congress. An amendment to the Farm Bill cosponsored by Reps. Earl Blumenauer (D-OR), Thomas Massie (R-KY), and Jared Polis (D-CO) passed the House on a vote of 225-200 in July and will now go to a joint House-Senate conference committee. And the Industrial Hemp Farming Act (House Resolution 525 and Senate Bill 359) is pending in both chambers. 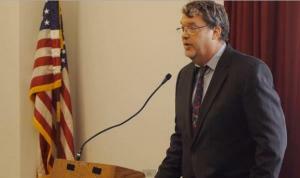 At a Tuesday Capitol Hill briefing organized by the industry group Vote Hemp (video embedded below), state and federal elected officials said they thought the Justice Department's policy directive on marijuana opened the door not just to regulated medical and legal marijuana, but also to industrial hemp production. Some states intend to move forward, they said. "That Department of Justice ruling pertained to cannabis," said Kentucky Agriculture Commissioner John Comer, "and hemp has always been banned because it's in the cannabis family. The Department of Justice ruling pertained to states with a regulatory framework for cannabis, and we feel that includes hemp as well. Our legislation set up a regulatory framework." 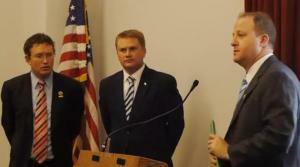 The legislation Comer is referring to is Kentucky Senate Bill 50, the Bluegrass State's industrial hemp bill, which passed the legislature with bipartisan support, gained endorsements by both of the state's Republican US senators, Mitch McConnell and Rand Paul, and became law without the governor's signature in April. It establishes an Industrial Hemp Commission and sets up procedures for licensing farming and processing. "We have a hemp commission meeting Thursday, and we are going to request that Rand Paul send a letter to the DEA telling them we intend to get going next year unless the Department of Justice tells us otherwise," Comer said. "We are taking a very proactive stance in Kentucky. We've been trying to replace tobacco, and hemp is an option not only for our farmers, but it could also create manufacturing jobs in our rural communities." The commission did meet Thursday, and it voted unanimously to move forward with industrial hemp production, aiming at producing hemp next year. "That's our first goal, to get the crop established. Then, once companies and industries see that we have a crop here established and growing, we believe industries will start coming here looking for it instead of importing it from other countries," said Brian Furnish, chairman of the Industrial Hemp Commission, after the Thursday vote. According to Vote Hemp, Kentucky isn't the only state planning on moving forward with hemp next year. Vermont just released its Hemp Registration Form that allows farmers to apply for hemp permits and the Colorado Department of Agriculture is developing regulations to license hemp farmers in 2014. North Dakota has issued permits for several years now. Imported hemp is now a $500 million a year industry, Vote Hemp's Eric Steenstra said. Congressman Thomas Massie (R-KY), who also played an important role in passing the Kentucky bill and who is a cosponsor of the House hemp bill, said he was encouraged by the Justice Department policy directive, but that it was not enough. "We need more than a Justice Department ruling," he told the press conference. "As a farmer and entrepreneur, I want some certainty. I want a legislative remedy for this, and that's why I continue to push hard for our bill, which would exclude hemp from definition as a controlled substance." But while the House hemp bill now has 47 cosponsors, it still has a long row to hoe. The hemp amendment to the Farm Bill, which would allow hemp production for university research purposes, has already passed the House and awaits action in conference committee. "If you can attach an amendment to a spending bill, then you can get action," said Massie. "I have to give credit to Rep. Polis for doing this. This is a farm issue, not a drug issue. And while there was debate over whether it was wise to even have a vote, it passed. People decided spontaneously to vote for it as an amendment." While the Senate has not passed a similar provision, Massie said he was hopeful that it would make it through conference committee. "There is no equivalent in the Senate, there is no companion amendment, but we do have [Senate Minority Leader] Mitch McConnell, who is all for it," he said. "I'm hopeful it will survive, and we'll continue to work on the standalone hemp bill." "It was important to get the House language in the Farm Bill," said Polis. "Not only does it allow universities to do research that is needed, but it also symbolically moves forward with embracing the potential for industrial hemp production." Polis said he was cheered by the Justice Department's policy directive when it came to hemp. "They listed eight enforcement priorities, and industrial hemp isn't even on the enforcement radar," the Boulder congressman said. "We see no federal interest in going after states or hemp producers. The risk is minimal. But minimal isn't good enough for some folks, and that's why we want to continue to gather support for the Industrial Hemp Farming Act. You don't want to have to depend on a federal prosecutor or the attorney general not getting up on the wrong side of the bed in the morning." Industrial hemp may be an afterthought for Justice Department policy setters, but the recent guidance has emboldened hemp advocates to push forward faster than ever. Getting hemp research approved in the Farm Bill would be a good first step; passing the Industrial Hemp Act would be even better. But it doesn't look like some states are going to wait for Congress to act. The Senate Judiciary Committee Tuesday afternoon held a hearing on marijuana legalization and conflicts between state and federal marijuana laws. 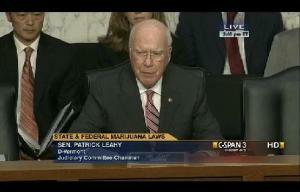 Led by committee Chairman Sen. Patrick Leahy (D-VT), the hearing featured testimony from the deputy attorney general who has set Justice Department policy, two officials in states that have legalized marijuana and one critic of marijuana legalization. The hearing marked the first time Congress has grappled with the issue of responding to state-level marijuana legalization and was notable for its emphasis on making legalization work in states where it is legal. It was also notable in that of all the senators present, only one, Sen. Charles Grassley (R-IA), bothered to dredge up the sort of anti-marijuana rhetoric that had in years and decades past been so typical on Capitol Hill. "Marijuana is a dangerous and addictive drug," said Grassley, who turns 80 next week. "It's illegal under international law as well, and the treaty requires us to restrict its use to scientific and medical uses. These [legalization] laws flatly contradict our federal law. Some experts fear a Big Marijuana, a Starbucks of marijuana," he lamented. Grassley's lonely stand reflects changing political realities around marijuana policy. The other senators who spoke up during the hearing -- Democrats Leahy, Richard Blumenthal of Connecticut, and Sheldon Whitehouse of Rhode Island -- all represent states where voters have already expressed support for medical marijuana and a region where support for outright legalization is high. They were all more interested in removing obstacles to a workable legalization than in turning back the clock. "Last November, the people of Colorado and Washington voted to legalize marijuana, and these new laws are just the latest example of the growing tension between state and federal marijuana laws and the uncertainty about how such conflicts are resolved," Leahy said as he opened the hearing. "Marijuana use in this country is nothing new, but the way in which individual states deal with it continues to evolve. We all agree on the necessity of preventing distribution to minors, on preventing criminal enterprises from profiting, and on drugged driving. But I hope that there might also be agreement that we can't be satisfied with the status quo." 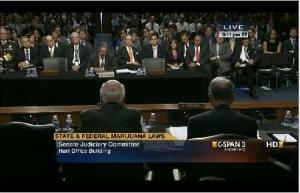 The first witness was Deputy Attorney General James Cole, author of last month's policy directive notifying state governments that the Justice Department would not seek to preempt their marijuana laws and instructing all federal prosecutors to leave legal marijuana alone -- with a number of exceptions. Sales to minors, the use of guns or violence, profiting by criminal groups, a marked increase in public health consequences like drugged driving, and distribution of marijuana into non-legal states are all among the factors that could excite a federal response, Cole's directive noted. On Tuesday, Cole reiterated and went over the policy directive for senators, but the most striking part of his testimony was his admission that the federal government could not effectively put the genie back in the bottle. "It would be very challenging to preempt decriminalization," Cole conceded in response to a question from Leahy. "We might have an easier time preempting the regulatory scheme, but then what do you have? Legal marijuana and no enforcement mechanism, which is probably not a good situation. You would also have money going to organized criminal enterprises instead of state coffers." The three Democratic senators all prodded Cole and the Justice Department to do something about the legal marijuana (and medical marijuana) industry's problems with banks and financial services. Because of federal pressure, such institutions have refused to deal with marijuana, leaving those businesses drowning in cash. The senators also questioned reports that the DEA had been telling armored car companies not to do business with marijuana businesses. "What about the banking industry?" asked Leahy. "A cash only business is a prescription for problems. We're hearing that DEA agents are instructing armored car companies to stop providing services to medical marijuana companies. It's almost as if they're saying 'let's see if we can have some robberies.' What is the department going to do to address those concerns?" "The governors of Colorado and Washington raised this same issue," Cole acknowledged. "There is a public safety concern when businesses have a lot of cash sitting around; there are guns associated with that. We're talking with FinCEN and bank regulators to find ways to deal with this in accordance with laws on the books today." "There should be specific guidance to the financial services industry," a not-quite-mollified Leahy replied. The committee then heard from King County (Seattle), Washington, Sheriff John Urquhart. "The war on drugs has been a failure," the sheriff said bluntly. "We have not reduced demand, but instead incarcerated a generation of individuals. The citizens decided to try something new. We, the government, failed the people, and they decided to try something new." Urquhart saw no great tension between the federal government and legal marijuana states, and he, too, brought up the issue of banking services. "The reality is we do have complementary goals and values," Urquhart said. "We all agree we don't want our children using marijuana. We all agree we don't want impaired drivers. We all agree we don't want to continue enriching criminals. I am simply asking that the federal government allow banks to work with legitimate marijuana businesses who are licensed under this new state law." The committee also heard from Kevin Sabet of Project SAM (Smart About Marijuana), the voice of 21st Century neo-prohibitionism. "In states like Colorado," he said, "we've seen medical marijuana cards handed out like candy, we've seen mass advertising. At the marijuana festival in Seattle we saw 50,000 people smoking marijuana publicly; it's the public use of marijuana that worries me. I don't see the evidence of trying to implement something robust, especially in the face of an industry that will be pushing back against every single provision. In a country with a First Amendment and alcohol and tobacco industries that profit off addiction, I worry that, inevitably, American-style legalization is commercialization, no matter the interests of state officials and regulators." But nobody except Grassley seemed to be listening. Marijuana legalization advocates and drug law reformers liked what they heard Tuesday. "It feels like there's a paradigm shift underway in the Justice Department's interpretation of federal drug control law," said Ethan Nadelmann, executive director of the Drug Policy Alliance. "They seem to recognize that drug control should be first and foremost about protecting public health and safety, and that smart statewide regulatory systems of the sort that Colorado and Washington are proposing may advance those objectives better than knee-jerk enforcement of federal prohibitions." "For years, the legalization movement has been gaining traction as people learn this is neither a fringe issue nor a partisan one, but one responsible for deep inequities in our justice system, the expansion of criminal gangs and the increase in unsolved violent crimes," said Law Enforcement Against Prohibition (LEAP) board member and former Denver cop Tony Ryan. "There's a long road ahead, and this hearing leaves many questions unanswered, but this historic discussion means we are on our way to a more rational and effective drug policy." "The Department of Justice is finally taking seriously the dangers that a lack of access to simple banking services poses to consumers, employees and business owners," said Aaron Smith, director of the National Cannabis Industry Association. "We are encouraged that the growing consensus among essentially all stakeholders is that banking access must be available to legal businesses. It portends a quick reform to this dangerous and unnecessary situation." "The era of robust state-based regulation is here," said Bill Piper, director of national affairs for the Drug Policy Alliance. "Legalizing marijuana and shrinking the number of people behind bars in the US is an issue the left and right can join together on. Like the repeal of alcohol prohibition, the repeal of marijuana prohibition will save taxpayer money, put organized crime syndicates out of business, and protect the safety of young people." But at a time when marijuana prohibition remains the federal law of the land, perhaps former Seattle police chief and LEAP member Norm Stamper had the most down-to-earth take. "While I would have liked to have seen a substantive change in policy, what we were really listening to in that hearing was the sound of a changing political climate," said Stamper. "People who can't agree on any other political issue are coming together over this one, and politicians on both sides of the aisle ignore that at their own peril."